Misdirection | Wott's Up With That? “Paging David Appell and Nick Stokes again: time to fess up and apologize” (2012-05-28). 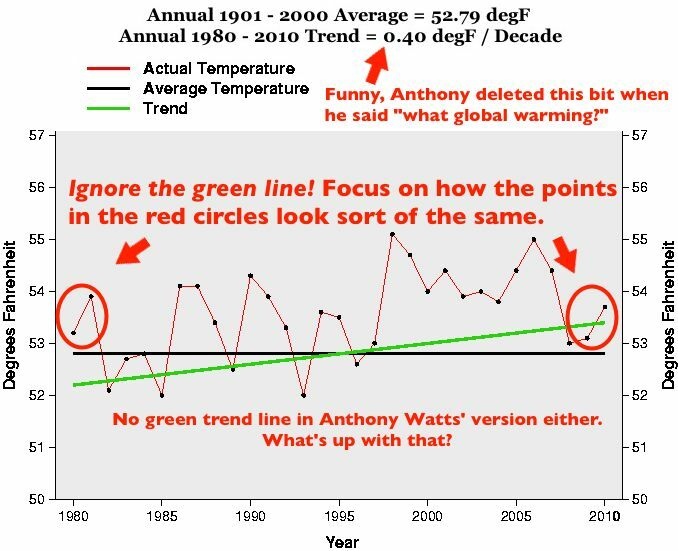 Those “alarmists” are always exaggerating, as Anthony Watts loves to imply remind us. Even about things as mundane as so-called death-threats! I mean, it’s not as if they’ve had to escape from the trunk of a kidnapper’s car, is it? Or that they were threatened with having their children “brutally gang-raped”. (What, that one’s true? Never mind.) And as anyone who’s up-to-date knows “You will be chased down the street with burning stakes and hung from your f*** neck, until you are dead, dead, dead!” is what all the cool kids say when they’re chillin’. Heck even (apparently actual) scientist Judith Curry thinks saying that “AGW fraudsters” should be dealt with thus – “Knock them down. Kick them until they quit moving. Check for breathing. Repeat.” – is simply a cute turn of phrase. So when Rupert Murdock’s The Australian declares “no death threats in emails [to climate scientists]” because an Australian’s freedom of information request for a specific institution, specific short period of time, and specific small number of individuals doesn’t turn up much, when that pretty much settles the question for Anthony. Forget all the stuff that happens outside that tiny slice of space/time! Doesn’t count. By the way Anthony’s completely unable to control any of the vicious stream of denialist comments that his readers, without his explicit encouragement, make. It takes all his effort just to censor his critics! No time left over at all for that other stuff, which is purely for theatrical effect anyway. As always, Anthony offers himself as exemplar. He get’s angry e-mails, but he’s strong enough to laugh them off. Man up, warmists, Anthony-style! He’d never overreact to the purely hypothetical situation of angry people trying to confront climate scientists at their offices or wave hangman’s nooses at conferences. Oh, wait. He did overreact, didn’t he? When little Anna Haynes showed up (uninvited!!!!) at his offices seeking to speak with him, he freaked. But that, of course, is different. One thing for sure, Anthony won’t mention the ABC News program Media Watch’s investigation into the coverage of threats against climate scientists. Nothing gets in the way of bluster like a factual dissection. He’ll stick with the pull-quote from Rupert Murdock’s The Australian, thank you. Update from the comments: Vicious denialist threats are pretty much routine and they are explained away by people like Anthony Watts, who do everything in they can to encourage them. “Johns Hopkins succumbs to heat wave mania“. (May 3, 2011) “Climate Change Analysis Predicts Increased Fatalities from Heat Waves”, published in Environmental Health Perspectives on May 1st, 2011, is about heat-waves and the impact of global warming on morbidity. Anthony Watts stumbles across their press release and incorrectly decides they’re talking about record high temperatures. Nope. Anthony seems to think that denialist meteorologist Joe D’Aleo’s 2009 analysis, and the stagnant Hall of [false] Record blog (where the 2012 elections will aways be “getting closer”), have the definitive scientific answer. People only die from cold! Also, a weird blurred-together “statewide” record temperatures chart doesn’t seem to support global warming. Anthony loves mashed together out-of-context data if he can use it to advantage, but what dim-wit actually thinks that rising temperatures can’t happen without lock-step new daily temperature records? There’s something about straight lines that captivates denialists.